We’re still experiencing warm days and nights here in North Carolina, but I know that chilly weather will be here any day now! And when it does arrive, nothing is more comforting to me than feeling the” hug” of my cozy home. Creating a cozy home isn’t just about putting out a few throws. While that’s certainly one element, I think there’s so much more! To me, a cozy home represents warmth, shelter and love. I try my best to keep that in mind as I’m putting my home together for the cold winter months. Make sure to scatter lots of seasonal patterns around your home. Just like there are “cool” summer patterns, there are “warm” winter patterns too! Make a room even cozier by mixing several patterns together. Bake anything with cinnamon in it. Nothing makes me feel “instant cozy” as much as entering a home and being greeted by the smell of cinnamon! I’m immediately drawn back to childhood memories and that feeling of nesting. Add a liberal dose of texture. Oh my goodness – there are sooo many ways to add texture to your home! Think plants, grapevine wreaths, wood beads, shutters, baskets, textiles and on and on. Use warm colors throughout your home. I’ll never be a person who can live with all white. Don’t get me wrong – I think white interiors are gorgeous, but I need to be surrounded by at least a little bit of warm color. I think that gray can feel cold, which is why I’m so in love with the shade of gray that I used on both my dining room and office furniture. Pillows, pillows, pillows – use them everywhere! Pillows aren’t just for chairs and sofas. I love to use them in unexpected places! Try stacking them together under a table or stuff several down into a basket. Add something made with rustic wood. 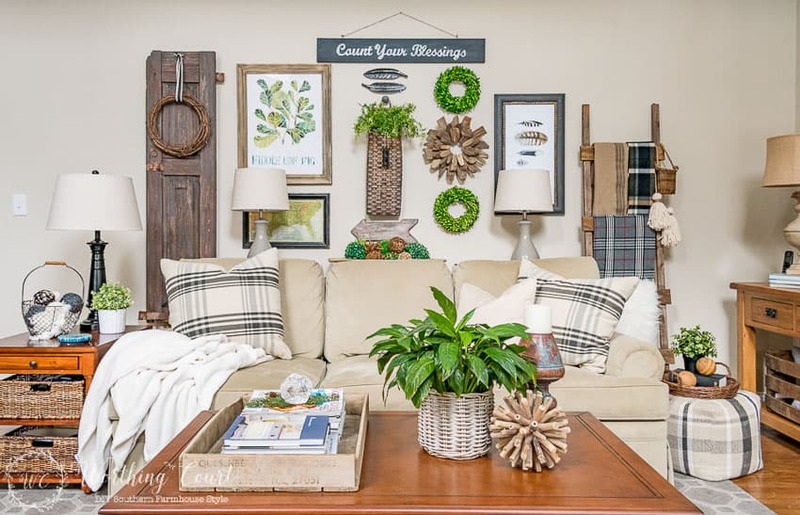 I have rustic wood sprinkled throughout my home – the table in my breakfast area, my diy sofa table in the family room, the old shutter hanging on the gallery wall behind my couch and my diy blanket ladder are just a few examples. I try to be careful not to go overboard with it – just touches here and there. 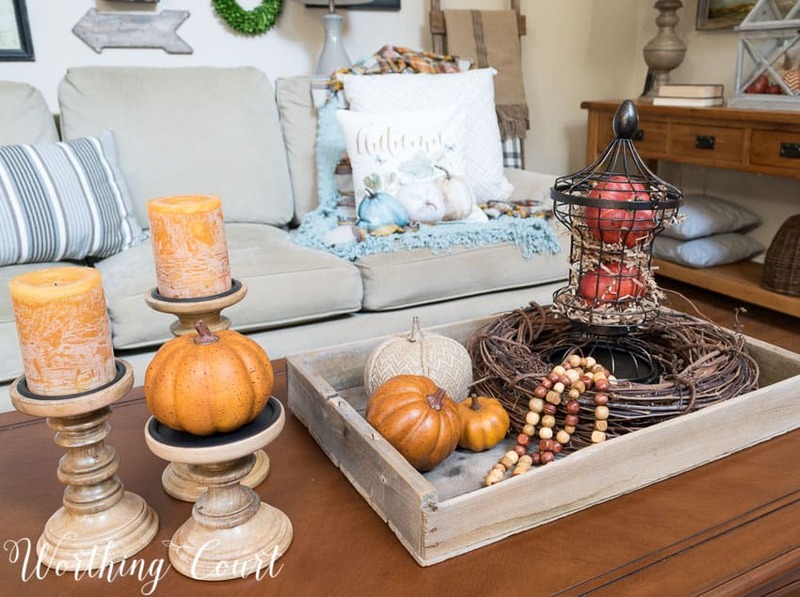 When you’re trying to cozy up your home for the cold winter months, remember – cozy isn’t just a look – it’s a feeling that you create in your home too! « September Recap + $100 Pottery Barn Gift Card Giveaway! The ladder is a wonderful idea for throws. I have 2 babies (dogs) and I can never find a place to put throws without them pulling them down to lay on or they just take up space and look like a mess. all these are great ideas and your home is beautiful. Fall has definitely arrived in my neck of the woods, which means that it’s time to have the chimney cleaned and start having fires in the evening! There’s basically nothing cosier than that. Your blanket ladder is my favorite. SO charming! Your home looks so cozy and welcoming. I love the color of your dinning room it looks great and your your livingroom looks good also. Love your tips. Just love the feel your decorating gives. The gallery wall is amazing. Love the look of the ladder. Absolutely love everything about your posts! Beautiful rooms, you have great taste!! Here in Vienna it is wet & turning cold already so I really appreciate your tips! Keep them coming. that’s the gray I’ve been looking for !! and love the chairs! thanks so much for sharing. I really like the ladder leaning against the wall and the textiles you’ve arranged on it … that definitely says “cozy” to me. One question: what are the items you have under the cloche (or bell jar, not sure what you call it.) I have one of those & am never sure how to style it. I’m taking note that you’ve wrapped the top knob with jute rope and have your items placed on a wicker tray. But I can’t tell what the items are underneath the cloche? Where can I find round wicker trays like yours? I’m new to your blog and really like your style, Suzy! Thank you. I love the gallery wall and especially the shutter! I use them everywhere. I love texture! I love what you did with the blanket ladder. I may steal the idea shamelessly!! I love the cream and grey colors! Th shutters and ladder are a great touch. I love the ladder! Will have to make me one! I like the idea of putting a table behind your sofa instead of pushing the couch up to the wall. The lamps add a nice dimension to your wall arrangement. I love the different textures on the ladder. So cozy! Thank you for the fall inspiration! 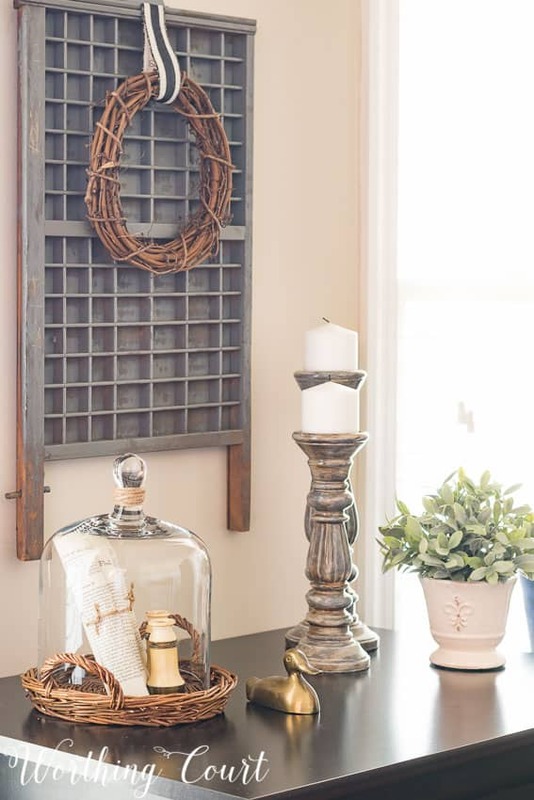 Love your gallery wall , especially the combination of textures and shapes. So glad I found your blog ! Love your style, love the ladder! Love the ladder with warm & cozy throws ! 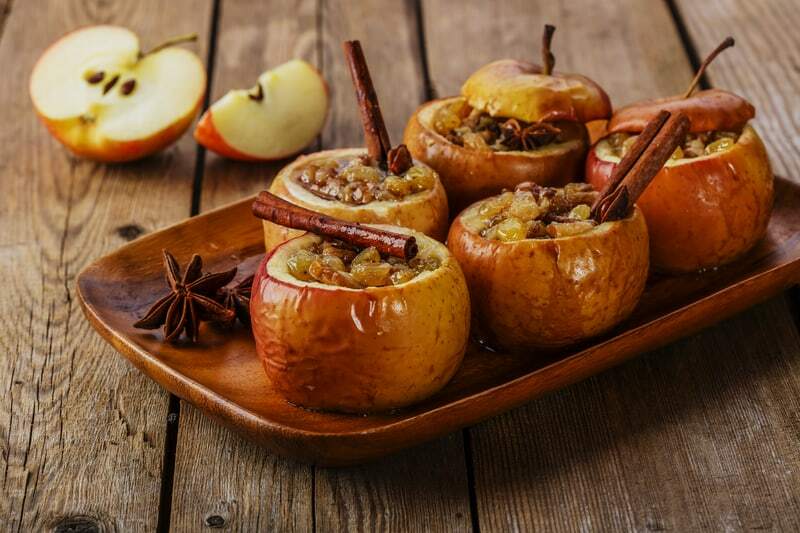 Fall is my favorite season, and your house seems so warm and inviting! Soooooo cozy for fall!!! I just love ladders, pillows and throws! !! Your space looks lovely and super inviting! Thanks for sharing these ideas! I was just in my local thrift store yesterday and was thrilled to find 3 brand new throw pillows and they only cost a total of $7.00. They’re perfect for my family room sofa, which was desperate for some new ones. Two of them are solid grays and the other has a gray print. I’ve been wanting to introduce more gray into the room and I’m very pleased. Next I would love to update the area rug. My Berber carpet is done in brown tones – do you think I can get away with a gray rug? Hi Jen. Lucky you for a great thrift store find! If you look around my whole house, it’s a mix of grays and browns. 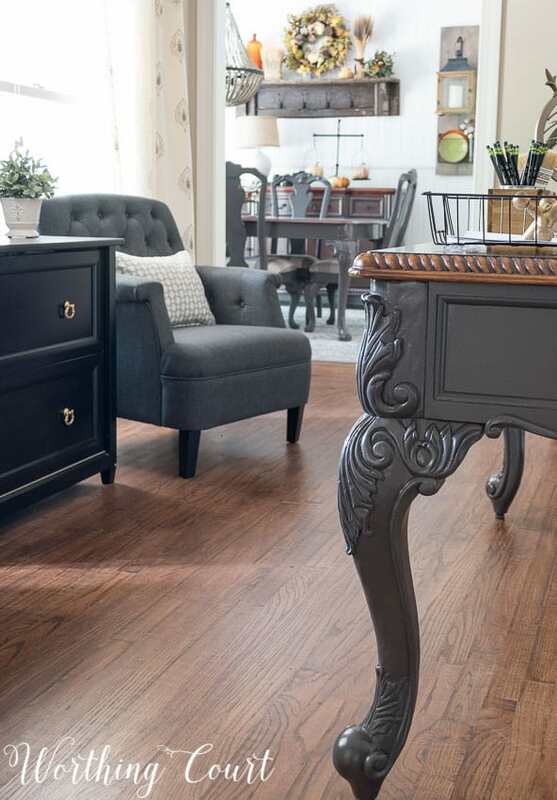 Think about brown hardwood floors that have a gray rug on them. I think the two colors work together beautifully! Put that way, it seems so logical! Thanks for answering, Suzy!! Your “Count Your Blessings Wall” looks amazing! I love your blanket ladder too! I had to come and read this one again today. I’m so worried about painting my living room today!? I couldn’t live with all white either and my husband had to put his two cents in so here goes the new color and hoping the cozy tips help me ease into it. The blanket ladder is a great idea! Looks warm and cozy. 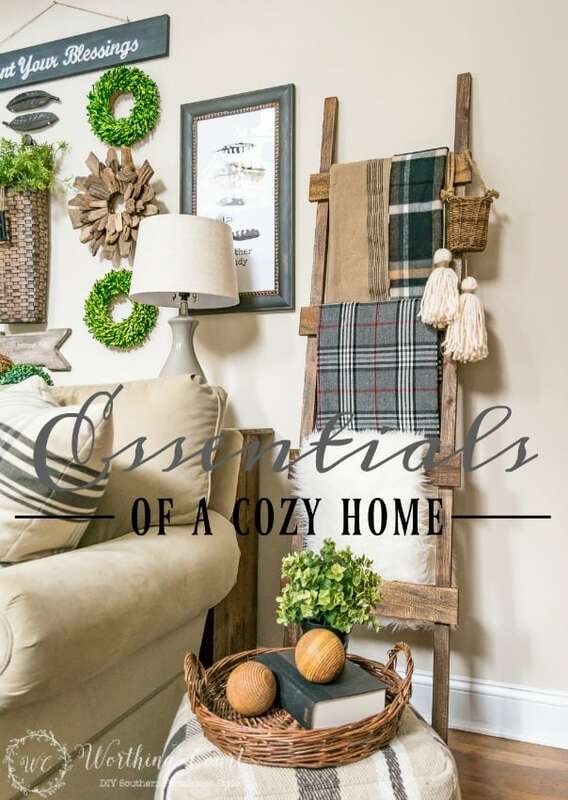 You have definitely accomplished your goal of creating a cozy atmosphere! Kudos! Yo ur home always has a cozy warm feel Suzy. Love the look. Thanks so much for the good tips! I love your gallery wall. It is just perfect. Great advice! Your home looks so cozy and warm and inviting! Love all the ideas and thanks for sharing the site for the three baskets…super idea to use one below the cloche!! Going to try that. I like a lot of accessories and don’t do well in a stark or pared down room…you have the knack for doing it so well with “cozy”! !